Yet the bilateral relationship isn’t all smooth sailing. Disagreements between the two have grown as Russia experienced a resurgence of its power over the past 10 years, reflected in its invasion of Georgia in 2008 and the facilitation of the separatist conflict in east Ukraine since 2014. Against the backdrop of a more assertive Russia, Belarus has started to feel worried about the prospects of bilateral relations, particularly as the Ukraine crisis unfolded, and there are concerns that Russia would not hold back from undermining Belarus’ sovereignty if the need arose in the future. Thus in order to balance Russia, Belarus began a rapprochement with Europe, and Brussels even lifted some of the sanctions against Belarusian economy and various high-level officials. Minsk has even come out against calls from Moscow to open a new Russian military airfield in Belarus. There are also disagreements over how the Eurasian Union operates, as Belarus is worried that Moscow uses the economic union to advance its political aims. Even CSTO’s work has been questioned. Since the military alliance has not been used in any capacity previously, it is often considered merely as a symbolic organization. Moreover, Belarus and Russia also often have disputes over energy prices, transit issues, and Minsk has at times been quite critical of Russia’s foreign policy towards its neighbors. For example, Minsk, despite Moscow’s pressure, did not recognize Georgia’s breakaway territories of Abkhazia and South Ossetia. Lukashenka also voiced criticism of Armenia, Russia’s long-time ally in the South Caucasus, over its policies in Nagorno-Karabakh, Azerbaijan’s breakaway territory. But despite all these disagreements, Belarus also needs Russia. Russian investments as well as trade is predominant in Belarus. In the security realm, Belarus shares Russia’s concerns that NATO forces are moving too close to the Russian and Belarusian borders. Moreover, Lukashenka’s rule has many similarities to that of Putin. Both are holding on to power for too long and are widely criticized for it. Both have been facing country-wide protests over the past year and are positioning themselves as strongmen. 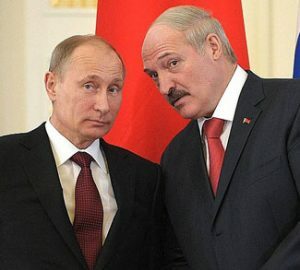 Thus when we talk about Lukashenka’s overtures to the West and the chances of changing the sources of Belarus’ foreign policy vector, his wish to hang on to power should also be taken into consideration. Although these are quite strong arguments, there are even larger geopolitical reasons which underpin Belarus’ attachment to Russia and latter’s interests in projecting its power over its western neighbor. From Russia’s perspective, Belarus’ geographic position makes it an important territory through which to project economic and political power. Belarus’ location on the North European plain has made it through the centuries an avenue for foreign invasions into the Russian heartland. Charles XII of Sweden, Napoleon, and Hitler in the 20th century all directed their Russian campaigns through Belarus. Nowadays when the European Union and NATO have made considerable headway into former Soviet space by signing EU association agreements and holding military exercises with Moldova, Ukraine, and Georgia, Russia perceives the area to be just as fundamental to its own security as in the past. Moreover, Belarus not only borders on core Russian territories – the Russian heartland– but also industrially and economically important regions such as Pskov, Bryansk, Smolensk, and others. More importantly, Belarus is geographically very close to major Russian population centers, notably the Russian capital Moscow. Keeping Belarus under its influence also gives Russia the possibility to project power far beyond the current Russian borders and deep into the Central Europe and the Baltic states. Belarus borders on Poland and Lithuania, both members of NATO and unequivocally anti-Russian in their foreign policy stance. Moreover, as Russia grapples with the ongoing Ukraine crisis, Belarus’s position has become doubly important as it borders on North Ukraine and is very close to Kiev. Thus, Belarus’ geographic position would largely explain Russia’s interests and its foreign policy moves. However, like in Ukraine, alongside pure geopolitical calculus there is also a cultural aspect to the significance Belarus bears for Russia. Belarusians are the Russians’ Slavic brethren and the country, like Ukraine, represents an integral part of Russian history. For the steadily decreasing Russian population, keeping the almost 10 million Slavic Belarusians in the fold is an important consideration. Going forward, Belarus and Russia will continue to face challenges in their bilateral relations. The issues will range from the security realm to wider political issues. Still, both countries will remain closely aligned with each other. Russia will remain a major economic power for Belarus, while Minsk’s rapprochement with the West will not cross the ‘red line’ where Russia will have to step in to safeguard its strategic interests in the western borderlands.